CUU LONG DELTA (VNS)— Rice yields for the 2013-14 crop in the Cuu Long (Mekong) Delta have reached the highest level in a decade. With the peak harvest season about to begin, rice fields have yielded about 1 tonne per hectare higher than last year's winter-spring crop. The Ministry of Agriculture and Rural Development's Plant Cultivation Department expects that the delta will have an average yield of 6.5 tonnes per ha for the winter-spring crop. However, farmers have been harvesting an average yield of 6.5 -7.5 tonnes per hectare. In some areas, including in Vinh Long Province's Tam Binh District, Tien Giang Province's Cai Be District and Dong Thap Province's Thap Muoi District, farmers have seen yields of up to 9-10 tonnes per hectare. Besides high yields, farmers have also received good prices, earning high profits. Farmer Pham Van Bang in Dong Thap Province's Cao Lanh District, who has earned a profit of more than VND300 million from 12ha of rice, said the price of rice had been unstable over the past two years but had increased this year. Pham Van Cong, who has harvested 4ha of rice in Hau Giang Province's Chau Thanh A District, said farmers were confident prices would remain stable as traders were giving deposits to farmers to buy rice in advance. 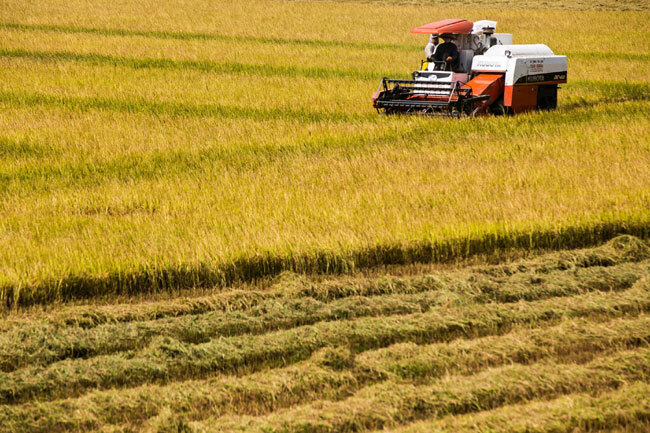 The delta's provinces and Can Tho have harvested nearly half of their winter-spring rice crop areas, according to local departments of agriculture and rural development. The delta, which planted 1.6 million hectares in the winter-spring rice crop, is scheduled to complete harvesting the crop in early May. Like several other provinces in the delta, Dong Thap has harvested the winter-spring rice crop early, and has completed 50 per cent of the winter-spring rice area. Dong Thap is expected to complete harvesting nearly all of its crops by the end of this month, according to the province's Department of Agriculture and Rural Development. Although Dong Thap has been harvesting at a rate of about 40 per cent slower than last year, this year's winger-spring crop has had less rice diseases, high yields and good prices, said the province's Sub-department of Plant Protection. In this winter-spring rice crop, Dong Thap farmers have switched from growing IR 50404, which has high yield and low quality, to more high-quality rice varieties. The areas of rice variety IR50404 in Dong Thap's southern districts have fallen to 40 per cent of the districts' total rice area compared to 90 per cent last year, according to the provincial Agriculture Extension Centre. Nguyen Thanh Huong, the centre's director, said farmers were now more aware that they needed to plant high-quality rice for export. For this winter-spring crop, the delta's provinces and Can Tho have developed more large-scale rice fields that grow high-quality rice for export. Large-rice fields in Dong Thap cover 80,000ha this year, compared to 2,400ha in 2008. In An Giang Province, the area of large-scale rice fields is 16,000ha. Many farmers in An Giang have taken part in production models like large-scale rice fields, in which farmers contract with export companies to grow high-quality rice. By doing so, production costs have fallen by 10-20 per cent compared to traditional rice cultivation, according to Doan Ngoc Pha, deputy director of the An Giang Department of Agriculture and Rural Development.